Janoschka Academy is hosting different internal and external workshops and trainings. Specialist knowledge and experience combined with the latest technology are the secret of Janoschka’s success. As leading partner within the prepress supply chain, Janoschka is keen for regular technical updates and developments. For this reason, and already keeping a lid on Drupa 2012, 19 people out of the Janoschka network (13 companies out of 6 countries) met in November in Stuttgart to get updated about the future of prepress. The 2 days meeting was hosted at the ESKO training center in Stuttgart. Topics were the future of Illustrator with DeskPack, plugin’s and the impact of working this way for traditional prepress software. 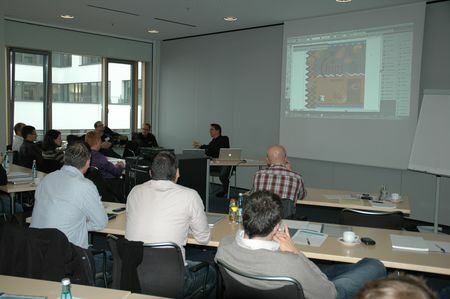 New features of DeskPack and ArtPro were demonstrated and explained from 2 ESKO experts. The possibilities of InkTools with Color engine and the very promising part of dynamic content for repro and artwork was also covered just like the new Automation Engine, WebCenter, Nexus and all the modules around this topic. Questions and answers with the experts completed the sessions. Janoschka Academy will continue in 2012 with more events in different fields of activity.